Russia’s Military Is Already In East Ukraine. Will There Be A Full-Scale Invasion? KIEV, Ukraine -- The troops, the tanks, and the artillery is in place. The shelling has begun. Is this just another skirmish? Or something much, much bigger? 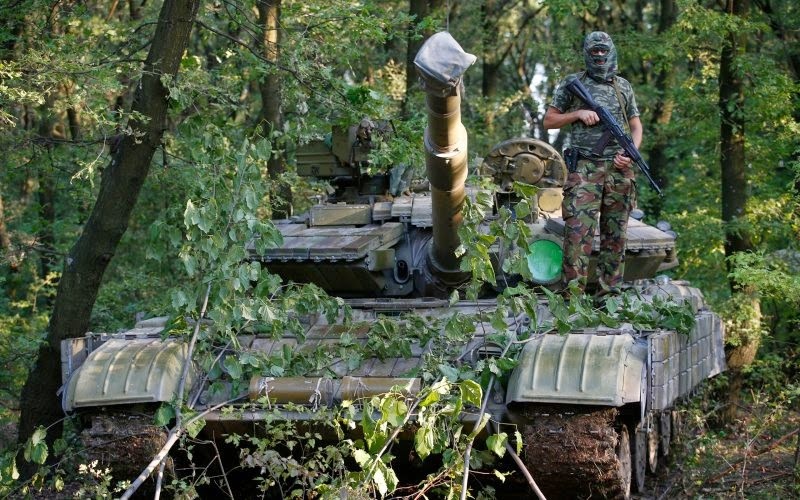 Camouflaged Russian tank, in Eastern Ukraine. Right now Russia is moving troops, armor, and advanced antiaircraft missiles toward the border with Ukraine. In the last 48 hours, dozens of videos have been uploaded to social-media sites that show Russian armor very close to the border, many of them confirmed to be within mere kilometers of Ukraine. On Thursday, my team at The Interpreter definitively geolocated Russian armor only 2,000 meters (6,562 feet), and closing, from the border and a Buk, the same type of missile that likely took down Malaysia Airlines Flight 17, only a few hours from being within range of Ukraine’s air force. Columns of tanks, marked with the same painted numbers and flat, pale-green paint we’ve seen in Ukraine since (at least) June 20th, were spotted moving en masse toward a key border crossing. Some Ukrainian journalists are reporting that at least some of this armor has already crossed the border. Russia’s helicopters held ground-fire exercises Friday on the border between Russia’s Rostov region and Ukraine’s Donetsk region. The head of Russia’s airborne units, which played a critical role in the conquering of Crimea, has pledged to expand operations beyond the boundaries of Russia (tanks marked with the insignia of Russian Airborne forces were captured by Ukrainian troops just yesterday). The Ukrainian government now says that its military has detected even more advanced antiaircraft batteries lined up on its border. There is now significant evidence that Russia is openly supporting the separatists militarily and many experts now believe that Russia could invade and beat back the Ukrainian anti-terror operation. An open war between Ukraine and Russia may have already begun. In the last 24 hours, there are reports of cross-border shelling in new locations and 17 new Grad rocket batteries digging in on the Russian side of the border, but within range of the Ukrainian military’s front lines. This is even more concerning when it is put into context. In the last two days, two different Ukrainian military convoys have been destroyed by Grad rockets south of the MH17 crash site, in Shakhtyorsk and near Torez. Russian paratroopers have even taken pictures with the bodies of the Ukrainian soldiers and have posted them to social networks. This isn’t the only time Russian soldiers have posted pictures from inside Ukraine, which has caused the Russian government to discuss banning their soldiers from posting to social media. Why is there fighting near the MH17 crash site? Strong evidence suggests that a Russian-supplied and crewed Buk antiaircraft missile shot down MH17. The missile was deployed to this area in order to defend the road that links the separatists’ positions to each other and to Russia. These towns are so vital to the Russian-backed insurgents that the separatists decided to place their most advanced SAMs in the area to defend against Ukraine’s air force. This also means that the town has become one of the primary goals for both the separatists and the Ukrainian military. How important is this area to the separatists? Earlier this week a large convoy was spotted moving toward the town. The video of the convoy, labeled “troops from Russia,” shows a large group of heavy armor—mostly BMPs, towed artillery and antiaircraft guns, troops transports… and two Strela-10 advanced antiaircraft systems. All of the vehicles have uniform paint configurations, but those paint configurations don’t match the Ukrainian military’s. These weapons very likely came from Russia. Now, a series of videos reportedly show large amounts of Russian armor and helicopters staged right on Ukraine’s border. While we have not definitively located the video, in one video tanks can be seen crossing a pontoon bridge into Ukraine. In multiple areas in this region, Ukraine is divided from Russia by a river. The tanks in this video are either crossing into Ukraine or they are training to do so. Will Russia outright invade Ukraine this weekend? But do they need to? There is conclusive proof that Russia has been shelling Ukraine since at least July 16th, the day before MH17 was shot down. Russian Grad rockets are ripping apart Ukraine’s front lines. Russian tanks and armored vehicles appear to be streaming across the border, providing the separatists with greater firepower with each passing day. So far, Russia hasn’t needed to invade in order to invade. But they finally have enough firepower in place that they could if they want to. Is this just saber rattling? Russia has been poised to invade Ukraine on multiple occasions and it has not happened yet. But in the weeks before and after the downing of MH17, thousands of “tourists” driving tanks and armored vehicles that appear to be from Russian military stockpiles have crossed the border and joined the fight against the fledgling Ukrainian government. Even if Russia does not formally invade, how much of this equipment will not-so-quietly slip across the border and reinforce an insurgency which has already cost so many civilian lives? Washington, it seems, may be getting the picture. USA Today reports that according to a Pentagon spokesperson the United States will now supply “armored personnel carriers, cargo and patrol vehicles, binoculars, night-vision goggles, and small patrol boats” to the Ukrainian government, and will step up efforts to train the Ukrainian National Guard. But with Russian tanks and antiaircraft missiles just minutes away from the border, it’s worth noting that the new U.S. aid to the Ukrainian government could take months to have an effect on the front lines. If Russia decides to invade Ukraine with its regular forces, the international reaction could be unpredictable, it is most likely that Russia will find its self surrounded by new kind of curtain the Chobham Armour curtain, until the day it collapse from within.